I am currently about to start my third year at Amherst College a small liberal arts college in Western Massachusetts in the United States as a Black Studies and Women and Gender Studies double major and German as my language focus. This is a completely different path to the original plan I had in high school, which was to study accounting and eventually become a Chartered Accountant. I was fortunate enough to receive a scholarship from the Student Sponsorship Programme (SSP) in high school and SSP played a large role in my being where I am today not only for financial reasons but through help with University applications, career guidance and personal support. SSP also influenced my interest in working with the Center for Community Engagement (CCE) at Amherst College because even though I have a busy schedule as a fulltime student, I think it is important to help out where you can. Once I week I tutor at A Better Chance (ABC) a national programme that takes young boys from disadvantaged backgrounds and puts them in some of the best high schools in America. Every summer, the CCE and other departments at Amherst provide a stipend for students to go to any country in the world and intern with any community-based organization. I wanted to do something in South Africa so that I could be home and still do something productive during my school vacation and more especially work with an organisation with a focus on education and/or youth development. Thankfully we live in a technological age so I just googled the type of organisations I was interested in working with, found IkamvaYouth Gauteng within the Siyakhula Education Foundation, emailed them stating my interest in working with them and the rest is history. I have to say, for the name SEF has made for itself, the organization is quite small. I expected the Siyakula and IkamvaYouth staff to be more than twenty people but they do not even reach ten. I was really nervous the first day I arrived but I think due to the size of the people working at SEF there is a certain bond shared and I felt comfortable in no time. One of the first chats I had with Andrew Barrett, he told me that with Education in South Africa, however bad you think it is, it is actually much worse. One of the most powerful things he told me though is the fact that 80% of South African schools are basically write-offs and it would make no difference whether they were open or closed. That struck me very much because even though I was raised by my mother as a single parent who was also the only one out of her five siblings with a stable job, I managed to go to one of the best schools in East London, Clarendon High School for girls and passed matric with four distinctions. Sometimes you become very closed off to other environments and don’t realise the extent of the inequalities that exist out there. A country like South Africa that is only in its 17th year of democracy is a great place to study the gender and racial inequalities that exist because seventeen years in not enough time for the results of the restitution policies implemented to be visible. IkamvaYouth and EwB joined hands to build future Mathematicians. Knowing that pass rates are low in mathematics at grade 12, a closer look has been taken to understand why learners perform so badly in maths. One of the major points that came up is the foundation of mathematics; maths is like ladder: you can’t jump one step and expect not to fall. Without understanding grade 8-level maths it makes it difficult to fully grasp grade 9 maths and the chain continues to grade 12. For example, with some learners, it’s not that they don’t understand the trigonometry, but it’s the fraction within the trigonometry with which they’re struggling and leads them to get the math wrong. Yes We Can Maths provides the platform to understanding these basics through the yellow and green books at grade 8 level; they start at the basic core of mathematics Addition, Subtraction, Multiplication and Division. From there the books provide opportunities for learners to practice applying all of those skills to complex maths like fractions, exponents, etc. This being basic mathematics, most learners they don’t think they need it due to the use of calculators. However, once one starts to challenge learners about how much they are depending on calculators, they realise that they don’t even know the methods of solving simple multiplication. Through this project we are tearing down a fundamental problem of mathematics education in South Africa. Some highlights and challenges from the learners’ perspective, we asked couple of questions: How do they feel about the books? Is there anything would like to change about the class or tutor? And do you think the books are helping in your school work? It has been wonderful having these grade 8 learners join IkamvaYouth. In addition to the EWB project they have also been exposed to English tutoring and the full range of holiday programme activities. 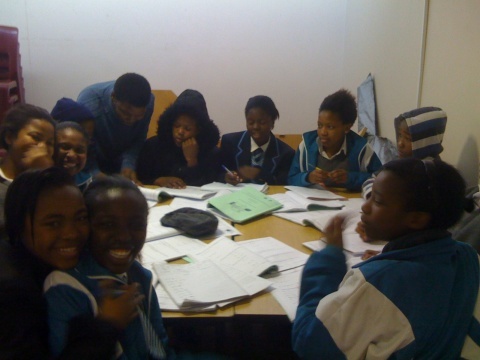 Thank you to EWB for enabling us to work with these learners. 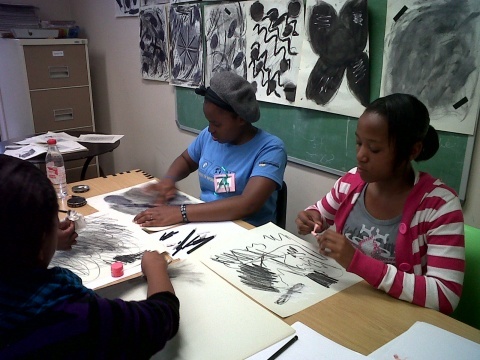 IkamvaYouth has the primary goal of enabling youth living in townships to access education. Thus the winter school had to squeeze in some tutoring time, much to the disgruntlement of the learners. Luckily a full scale revolt was evaded by the dedication of our volunteers who orchestrated literacy and numeracy fundamental sessions and somehow made learning fun! Or maybe their discontent was quelled by the wide range of exciting and novel workshops and excursions; tai chi, computer blogging, drumming leadership, yoga, drama, creative writing, dance, debating and many more. A wonderful day was spent rock pooling under blue skies in at Cape Point and at St James with SaveourSeas Shark Centre. The budding journalists were bused off to Pinelands for a crash course in magazine production. Read about this project at www.livityafrica.com. We also made a trip to University of Western Cape for a Fun Day for all 3 Western Cape branches. The winter school is hugely significant for the underlying impact that it has on students: social skill development; productive engagement throughout the holidays; time to explore ones own interests; meeting and talking to peers; learning to appreciate volunteers; learning to believe in yourself. 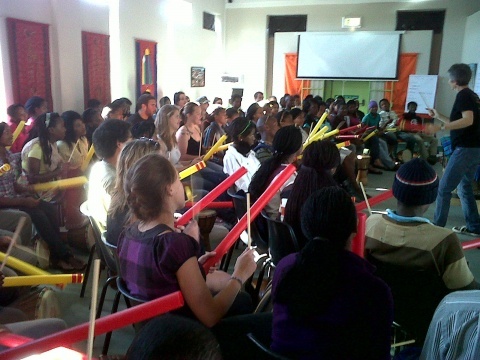 A Grade 10 learner commented: ‘I have had the bets time of my life here and I will always carry this memory with me’. I would like to use this time and thank all tutors who took part in our Winter School and all the people who volunteered their time and facilitated workshops for our learners. Thank you too to our partners and sponsors for making this important event possible: UWC, Fedics, Dr Peter Mills and the Answer Series. Trust me tutors if it was not for you guys, Nyanga Winter School would not have been a success!!!! During Winter School the Nyanga Branch was honoured by the presence of Nina who facilitated workshops for a week on Radio broadcasting and production.The learners took part in sessions where they were required to share life experiences and learn more about life from each other using the radio workshop and record their thoughts and interview each other. Comment from Nina: “The young participants were amazing, enthusiastic, and smart. For some, expressing themselves in English proved very challenging, but they were always checked in and present with the process. The revelations of radio were exciting for them too, handling equipment, recording their voices and playing it back in a very vulnerable public space. Considering time and language constraints, we covered two production modules that would best serve the workshops; interviewing and audio diaries”.